Mexico: October 15, electrifying mobilization to defend Luz y Fuerza and the SME - General Strike Now! Up to half a million people turned out in Mexico City to demonstrate their support for the Mexican Electricians Union (SME) on October 15. In spite of all the government and media campaign, the workers were not intimidated. On the contrary, they came out with even greater force. This marks a major turning point in the situation in Mexico. Historical, powerful, sweeping, explosive, organized and militant was the mobilization that was organised on October 15th by thousands of workers in defence of Luz y Fuerza del Centro (LyFC) and workers of the Mexican Electricians Union (SME). This mobilization exceeded expectations in both assistance and political level. The streets of the historic centre of Mexico City were crowded by contingents of workers, but also in the rest of the country similar marches where held. Politically, things went beyond the struggle against the decree to abolish LyFC, especially the anger that exploded against the PAN government. Two hours before the start of Thursday's mobilization, contingents had already gathered around the monument of the Angel of Independence. On the streets outside one could listen to the slogans of the SME. In a short time, a tide of red shirts of fellow electricians mingled with flags and colours of other organizations and trade unions: rank and filers of the PRD, telephone operators, the STUNAM, SITUAM, IMSS, Atenco, students from UNAM, UAM, IPN etc. Since the beginning of the mobilization it was clearly established that this was a real period of struggle. With the comrades of the SME also came their families, children and youth; women and men who see this struggle as their own. The SME has increased its forces; it now also has the sympathy of thousands of workers in other labour sectors. Everyone had something to say, some displayed the classic slogans, one covering the whole street said simply and defiantly "we will not take it". A dog carried signs of support, a child with bullhorn in hand gave messages of support, an elderly man raised his fist and smiled at the same time. It was a coming and going of people, improvised banners were raised up high. Many workers, on their own initiative, reproduced pamphlets that they themselves wrote and distributed. The initiative, creativity and audacity of the exploited masses had established from the beginning the outright rejection of Calderon's decree against LyFC and the SME. Prior to this mobilization a furious campaign was launched in all the bourgeois media, all with the same slogans: support for Calderon and the demonization of the SME workers calling them corrupt, inefficient, and other such nonsense. Televisa and TV Azteca (to cite two cases) acquired a whole new list of "intellectuals" who devoted themselves to repeat the lies of the PAN government. But the attendance of thousands of workers to this mobilization made it very clear that the intention of demoralizing them did not work. The mobilization was flanked all along its way by people who encouraged the contingents, from the balconies with rose red and black flags, tourists took pictures and smiled amiably. Those who encountered the march without expecting it, were surprised to see the mood that existed and one would not have expected less; it was an electric atmosphere with full-throated chants. When the spurious Calderon made the announcement against LyFC he felt assured that the "tempting" severance packages, the media campaign and other measures would be sufficient to diffuse a response from labour, but what happened was the opposite. Far from being intimidated and meekly accepting the attack, the SME workers and the thousands more behind them, have taken to the streets. Additionally in most states of the Mexican Republic major mobilizations took place as well. The specific figure of how many people participated is not yet clearly known, but the mobilization began at 4pm and it was not until 10.20pm that the last contingent arrived. That is six hours of contingents marching towards the Zocalo, the capital's main square. 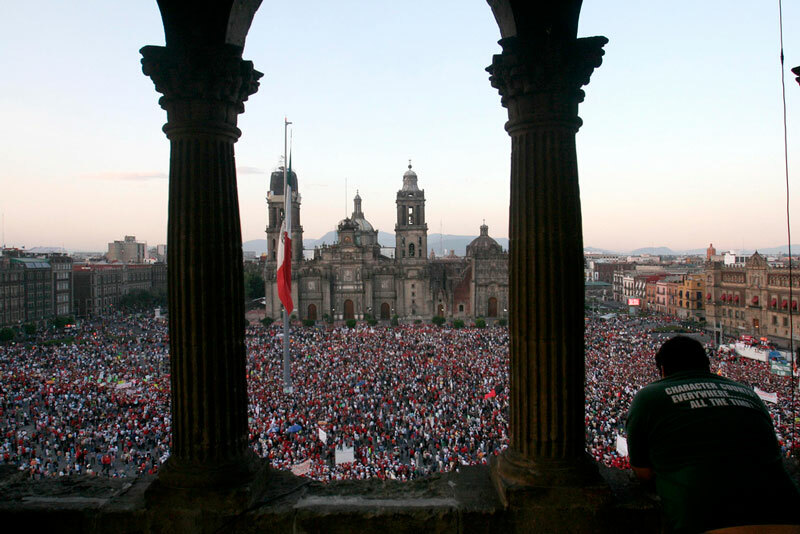 When the last comrades arrived, the rally had already finished, but the Zocalo was still packed. The assistance probably exceeded half a million people. The only thing Calderon has done with this decree is to awaken and strengthen the feeling of anger toward his government. Also the economic package for 2010 will be a blow to the families of workers and poor peasants who already have suffered the onslaught of right-wing politicians in power. This day is historic and is pointing to an even stronger stage of class struggle than what we have seen in the past; it is likely that as the anger grows, it will exceed the mood we lived through in 2006 following the mass struggle against the electoral fraud that Calderon imposed. Photo by Frecuencias Populares. Not only should we remember the number of participants in this campaign, but also the political content of it. Actually, the demonstration did not simply demand the removal of Calderon's decree. No, this day was an opportunity to repudiate the whole policy of the current right-wing PAN government and those of the past. Workers continue to have very fresh in their minds the election fraud, past privatizations, the innocent deaths of babies in Sonora, the general policy of salary caps, rising prices of household goods, social spending cuts, political prisoners, thousands of unemployed , the witty phrases of "and why me? ", the "eat and leave", etc.. This struggle is part of an ever-growing dissatisfaction with the real meaning of capitalism. Consciousness has grown and developed, as the slogans of the contingents clearly show. During almost the whole march one could hear "if there is no solution, there will be revolution," the slogan of the general strike was also heard clearly. This is very important and gives a profound sense to the struggle; it means that as rank and file workers we are increasingly aware that there will be another way of imposing our interests other than with a frank confrontation with the employers and bankers. On the other hand there were very clear slogans against the bourgeois parties, the PAN and PRI. This is also very important and is a clear indication that the ordinary worker has traced the footsteps of these parties and their actions, and has identified them for what they are: enemies of the working class. Among the ranks of the PRD there was a feeling of brotherhood, and this is another fundamental point because what is needed now is to launch a united front to unite all workers, youth and poor peasants. The movement is moving towards unity, the participation in the mobilization by different unions indicates this, but also the support of Lopez Obrador, along with thousands of his followers, have shown their sympathy not only in words but also in actions, in the struggle alongside the comrades of the SME. At all costs we must fight against any division of forces; our task is to call a general strike demanding a whole program which reclaims the rights of all workers. Martin Esparza's announcement to fight for a collective labour contract for all Mexicans equal to that of SME is entirely correct, but what is needed is to take concrete steps towards this with clear tasks. For a United Front of all trade unions, leftist parties, peasant organizations, student organizations, neighbours’ associations, etc., against Calderon's anti-labour policy! For the defence of LyFC and the overthrow of Calderon! During the rally it was voted to reject severance pay to workers as a solution to the conflict. A unanimous "no" to this trick of the PAN was raised. That is a fundamental point because at the same time it raises the struggle as the only alternative. However, one element remains to be debated; we refer to the constitutional controversy to topple Calderon's decree. Here we must say that legal means, the debate in Congress, the negotiations with the Ministry of Labour and the Interior Ministry cannot be the main strategy. The strategy once again must be for an open and honest struggle on the streets, and with this the general strike. What was not achieved on the streets cannot be achieved in Congress, much less so knowing that the PAN and PRI have the majority in this instance. Let us recall that in 2006 it was these same legal institutions, the IFE, the Electoral Tribunal, etc., which approved the electoral fraud; we can cite cases like these by the hundreds. The struggle has just begun, now we need to further develop a regional and general coordination, including rural poor, students, rank and filers of the PRD, and all trade unions. The UNT must make a clear call to mobilize, as should Andrés Manuel López Obrador. To strengthen the fight and fill the workers with more encouragement it is important that calls for a general strike be made by union leaders and be accompanied by a specific date for such action. It is necessary to set a date for a general strike! But we must also say that this day was historic; here we open a new page in the history of liberation from the slavery of capitalism, here we open a new period that will define this country. We, the workers, must have faith and confidence in our own strength, confident that we are right and trusting in the fact that we workers have nothing to lose but our chains.